The Garden House by In.It.Studios is a compact home perfect for solitary retreats or for entertaining guests. Tucked away into the forest in Slough, UK, the one bedroom studio was built with sustainable timber and it features a sedum roof. Designed for energy-efficiency and sustainability, In.It.Studios' prefabricated homes aim to provide extra space as studios, offices, or guest houses. 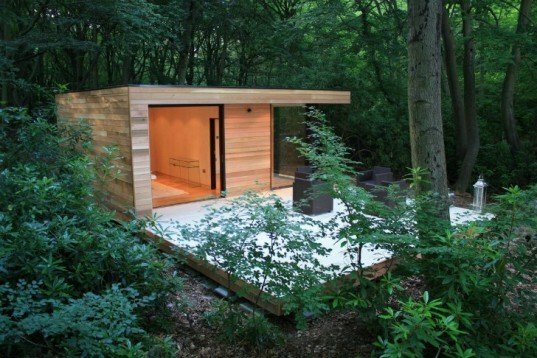 This particular garden house features a living area, a bedroom and a bathroom all tucked into a neat, modern package. The 400 sq ft Slough Garden House features timber construction and timber window and door frames that were all sourced from FSC or PEFC certified sources. Foam insulation boards with secondary thermoreflective foil membranes ensure effective insulation and act as a moisture barrier. Double glazed windows finish out the thermal envelope and the entire structure is clad in Western Red Cedar, which is durable and requires no treatment. The high-performance wall, roof, and floor were all prefabricated and then assembled on site. Built on a concrete plinth system from Swift, each garden house could easily be moved off its foundation and relocated if necessary. Finally, the cantilevered roof provides sun and weather protection to the house and a sedum roof provides insulation and rainwater absorption. In.It.Studios can build these prefab annexes in a number of sizes and prices start at £15,391. The 400 sq ft Slough Garden House features timber construction along with timber window and door frames. All the timber is sourced from FSC or PEFC certified sources. Foam insulation boards with a secondary thermoreflective foil membranes ensure effective insulation and act as a moisture barrier. Double glazed windows finish out the thermal envelope. The entire structure is clad in Western Red Cedar, which is durable and requires no treatment. The high-performance wall, roof, and floor assembly were all prefabricated and then assembled on site. The interior is simple and compact and large enough for a living room, bedroom and bathroom. A radiant heater is sufficient to heat the entire space. A compact bathroom features modern fixtures. Built on a concrete plinth system from Swift, each garden house could easily be moved off its foundation and relocated if necessary. Finally, the cantilevered roof provides sun and weather protection to the house and a sedum roof provides insulation and rainwater absorption. 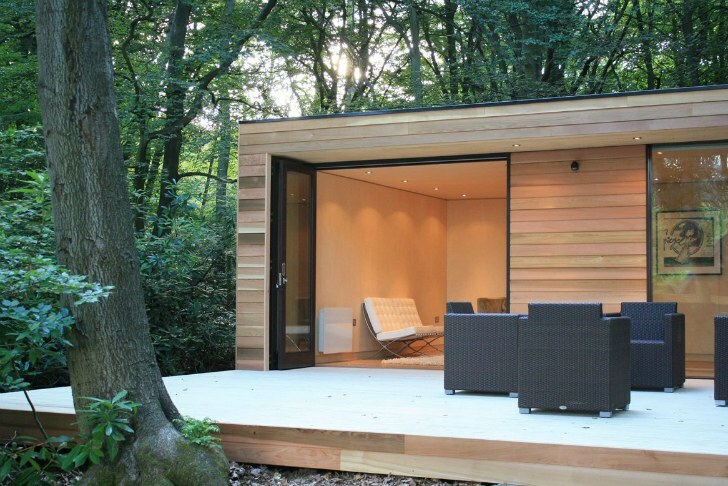 In.It.Studios can build these prefab annexes in a number of sizes and prices start at £15,391. Floorplan of the Slough Garden House.